A couple of years back now I had entered what I thought to be a standard medal at my home course of Dunblane New Golf Club. However it wasn’t until I had completed a solid 18 holes with net score of 2 under had I realised that the competition was qualifying for a national event which consisted of two further competitions at both the Queens course at Gleneagles and one of the Northern most courses in Scotland, Royal Dornoch. Having played the Queens a few times before, it was always going to be Royal Dornoch that gave me a sense of excitement. As I had not played a ‘Royal Golf Course’ before it made the occasion one to savour. As the date approached I looked forward to my weekend golf break away, and as luck would have it a good friend of mine had also qualified. This meant we could share the long drive north. The mini holiday began with a 9 am tee-off at the Queens, the weather was cold and particularly foggy leaving visibility relatively poor (which was the excuse I chose later for my not so fantastic scoring). So after the filling complementary buffet at the Dormy Clubhouse it was time to commence the 4 hour drive north, up the A9 through the Scottish Highlands, to get to the hotel ready for our early start the next morning at Royal Dornoch. The raised greens resemble upturned saucers and demand precise iron play and a tidy short game. We had looked into where to stay as soon as we had discovered our qualification for the competition. With plenty of good accommodation available for a golf break in Dornoch we came across the Dornoch Castle Hotel located just over the road from the historical early 13th century Cathedral. With parts of the hotel dating back to the late 15th century, we were not sure what to expect but reviews seemed positive, prices were reasonable and it was only a five minute walk to the golf course so decided to book a room for our short golf holiday. Arriving at the family owned and run hotel you get the feeling that they pride themselves on traditional Scottish hospitality, unfortunately however as we arrived relatively late it meant we only had time for a couple of beers in the friendly bar before turning in. Tomorrow was the big day; we needed to be prepared for the early start. During the summer months the contrast between the green of the fairways and greens and the brown areas of rough can be quite striking. The day began with qualifying on the Struie course (the second 18 hole course in Dornoch, originally designed as the Ladies Course). The top half of golfers would get the privilege to play the championship course in the afternoon, meaning getting a good score on the card whilst playing the Struie course all the more important. Thankfully managing to shoot just a couple above net par meant I made it through to the final on the Royal Dornoch Course (my friend however was not so lucky, but got the chance to play the Struie for a second time). The difficult links conditions were something I was not used to, coming from a parkland background, however managing a solid round in the morning I felt confident as I tee’d off . 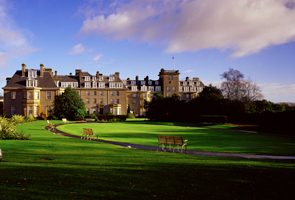 The spectacular panoramic views of the Dornoch Firth and the Ross-shire and Sutherland hills provide the setting for Royal Dornoch. 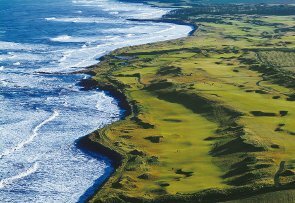 The course runs along the coast line which is only separated from the sea by the broad white sandy beaches, and has all the distinctive features of the best links including ridges, hillocks and dunes. 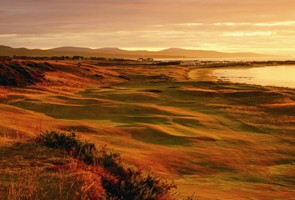 The setting is timeless, which is what makes Royal Dornoch such a pleasurable place to play. The par of 70 is spread evenly over the two nines with each having two par threes, six par fours and a par five. Many of the greens are built on natural raised plateaux with domed surfaces making approach play particularly difficult. 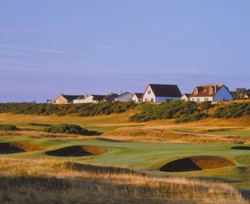 As well as amazing views of the North Sea, Royal Dornoch offers views of the nearby Ross-shire and Sutherland hills. This is a truly special place to play golf. Memorable holes include “Whinny Brae” the 161 yard par three 6th requires an accurate tee shot over to a green that is wrapped in thick gorse, which is made all the more difficult with the strong winds that often sweep over the coastline. And the long par four, 14th named “Foxy”, which measures almost 460 yards and does not include a single bunker which makes it one of the most straightforward and natural holes in golf, featuring a classical domed green. Unfortunately, however, I did not play particularly well during my round at Royal Dornoch, perhaps I was distracted by the beautiful scenery or the wind was just too strong for my game. As you would expect I thoroughly enjoyed my weekend golf break, playing 3 fantastically individual courses. It was a privilege to be able to play Royal Dornoch competitively and I would definitely recommend a pilgrimage to this very northern Royal gem. It may seem a lot of effort to get there, but considering it is regularly ranked in the top 20 golf courses in the world it is definitely worth bearing in mind next time you are planning a golf holiday in Scotland. Print article This entry was posted by Rory on October 15, 2012 at 3:13 pm, and is filed under General. Follow any responses to this post through RSS 2.0. You can leave a response or trackback from your own site.